A plea from a murder victim’s family; a dramatic bank theft; and an alcoholic sentenced for nicking booze. All fairly common story fodder for a local newspaper, you might think, the sort of stuff you could flick through anywhere in the country. But just savour the straightforward, factual but gripping headlines and intros in each of these sample stories from the East Kent Gazette on 23 November. 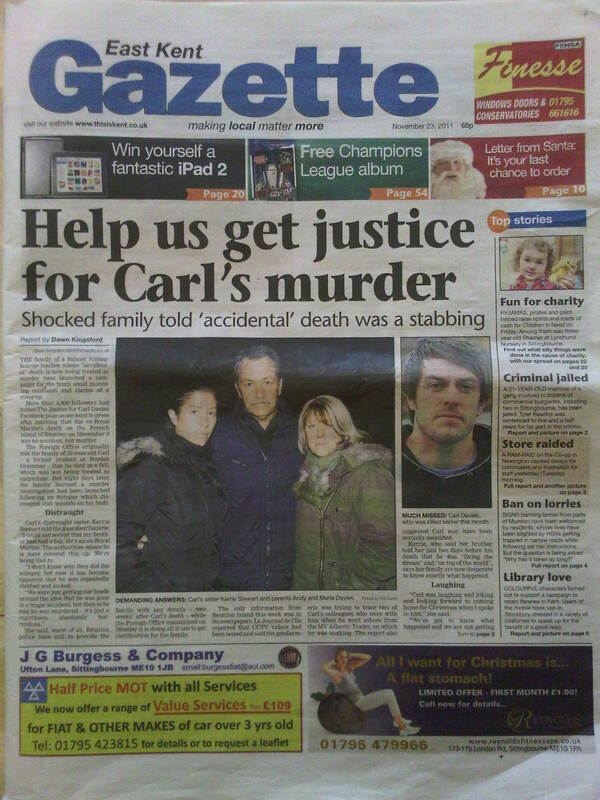 • Page one splash headline and subheading: ‘Help us get justice for Carl’s murder’; ‘Shocked family told accidental death was a stabbing’. • Page three lead headline and subheading: ‘Ram raiders drive off with Co-op cashpoint’; ‘Thieves block road with trees to slow down police’. No-one’s pretending these were the most stunning exclusives that have ever graced the 156-year-old Gazette’s pages. But they were detailed, interesting and well-crafted headlines and intros that made me want to read on, reminding me of that great advice to journalists by American writer Paul O’Neil. To do that in a local UK weekly in 2011 means there must be an experienced hand inspiring young hacks and tweaking copy. At the Gazette this hand belongs to editor Christine Rayner who has held the post for 16 years, having first joined as chief reporter in 1979. That’s a hell of a lot of knowledge and dedication serving local readers to a diet of useful, appealing and well-written news. And so it’s a crying shame that this, the editor, her staff and newspaper, are soon to be relics from the past. Because the Gazette, which covers Sittingbourne and the surrounding area, published its final edition today following a decision by owner Northcliffe Media to close it along with sister paper the Medway News. This blog will not always focus on closing newspapers, but during what is quickly becoming a winter of discontent for the local printed press it would have been churlish not to question whether this had to happen. The three stories highlighted above were among 150-plus on 21 news and features pages, with another 48 on seven sports pages, a healthy enough count for a local weekly with an overall circulation of 13,975. In the same 56-page Gazette – published two days before the closure announcement – there were 58 display adverts, hundreds of smalls in 11 classified pages and 135-plus properties displayed by nine estate agents in 12 pages of property. While those statistics may not be stunning, do they sound like the profit and loss columns of a failing newspaper? A senior Northcliffe source told me that the group’s entire collection of South-East papers – around 12 titles and some 45 editions – was still making around £1 m a year. Of these papers, the recession means some are making little profit, some are barely washing their faces and a few – like the Gazette – are rapidly losing money. Northcliffe have trumpeted the fact that this situation was worsened by the referral of the proposed sale of Kent Regional News & Media to the Competition Commission by the Office of Fair Trading. But I wonder how far the failure of the proposed merger with the KM Group is really to blame for the closure. It strikes me as fairly brutal to only consider the “foreseeable future” when these same titles have been making the company piles of money for decades. A total of 38 jobs will be shed by the closures. Could Northcliffe not have saved enough money by shedding half this number and keeping slimmer titles going with a skeleton staff during the recession? Until today, the East Kent Gazette’s strapline read: “Making local matter more.” No wonder, then, that locals were confused at its fate. If anyone does have such faith in papers like the Gazette, it will be collectives, charitable trusts or local business consortia – not companies driven by the stock market to make short-term cullings that appear to contradict the straplines of their own products. Even the most academic of newspaper analysts are now of the opinion that this sort of restructuring has to be considered for the long-term survival of the local press. This includes experienced former editor Neil Fowler who has contributed to ‘Is there a better structure for news providers’ published by the Reuter’s Institute for the Study of Journalism. A free summary of this report is available online. Two great local papers crucified in little over a decade. The executives who caused this decline will probably be boasting about the number of titles they were in charge of on their cvs, but they should be named and shamed. Someone actually thought dropping the word “Medway” from the title of the News was a genuinely great idea. I wouldn’t trust these people to run a bath. As a former Medway resident for 50 years, I grew up with the Chatham (later Medway) News. It is a real shame that this and the EKG are to become things of the past, not to mention the regrettable fact that many well-respected journalists will be joining the ranks of the unemployed at a time when their skills and standards are needed more and more in the national press. Many of my and my parents generation are less ‘computer savvy’ than younger folk and to them the local papers have represented a vital way to receive essential local news etc. I suppose it is inevitable that, in our ‘on-line’ world the case for retaining such worthy publications becomes less convincing. Like everything eelse in our society, profit is now ‘king’. However I fear that the sudden deaths of these two locals will be the beginning of the end for so many similar publications. Thanks Christine and your team for all the great stories you have published in the past and I wish you all the very best for the future.